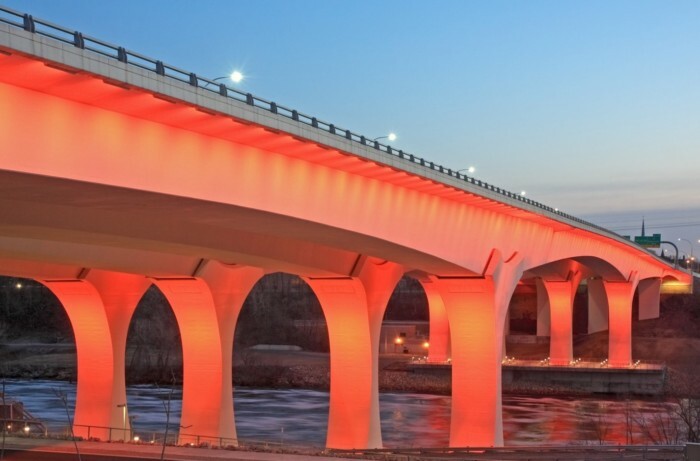 After the I-35W Bridge collapse, an aggressive rebuilding plan was needed to restore essential traffic flow to the Twin Cities. Because contamination was detected on the site and on the banks of the Mississippi River, Braun Intertec designed and inspected erosion control measures and access to the river for Stormwater Pollution Prevention Plan (SWPPP) purposes. To prevent contaminated soils from entering the river, we monitored drilling operations around the clock. Throughout the project, we oversaw the profiling, disposal and treatment of approximately 65,000 cubic yards of contaminated soil and more than 3,000,000 gallons of groundwater. Project engineers worked up to 80 hours a week to complete a foundation design prior to construction. Challenges included artesian water pressures in the St. Peter sandstone. To maintain the schedule, we coordinated up to four drill rigs working seven days a week, and during the first months of the project, we had environmental and geotechnical field staff on site 24 hours a day working in sub-zero temperatures. Since the I-35W Bridge project, the client has invited us to work with them on future bridge and infrastructure projects throughout the U.S.